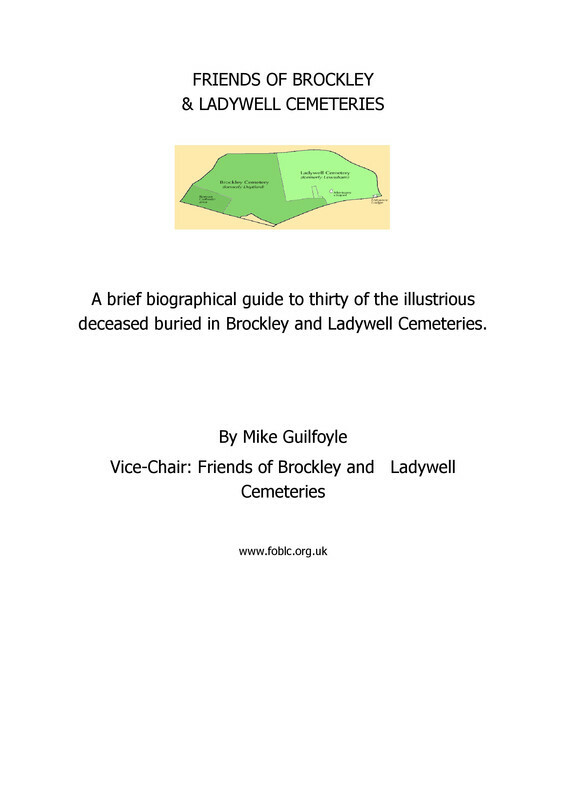 The Brockley and Ladywell Cemeteries contain several monuments dedicated to the Soldiers, Sailors and Airmen who were killed in the First World War. Those fallen in service are also commemorated in many of the family graves and two FOBLC members, David Platt and Michael Martin, have been researching this and uncovered the fascinating story of one family, the Buddells. Early in 1915 it was decided by the British Government that it would be impossible to return all the dead from the Great War to Britain for burial. As result it became policy to not return any and that they were to be interred where they fell with their comrades. This presented problems to the families of the dead buried abroad after the war. While today it is relatively easy to visit the battlefields of Northern France and Belgium, in the 1920’s it was only the very rich who could afford to do this, unlike in America, there was no financial support offered to relatives to make these visits. The old battlefields also lacked accessibility and accommodation for the hundreds of thousands of mourners that would have liked to visit until they were finally cleared in the mid 1930’s. It seems that, in England at least, it became common practise for families to commemorate their fallen husbands and sons on their own family graves and tombs. This took two forms; either a small monument added to an existing family grave of a relative, usually the mother or father, when one of the parents died an inscription was added to their headstone. On closer inspection of headstones of burials from the 1920’s you can find many of these inscriptions. When these dedications were new and easy to see, before weathering and nature began to reclaim these graves, it must have been a stark and startling reminder of the scale of the conflict and sacrifice of these men and their families. Some of these inscriptions contain enough detail to build up a picture of what was involved and make it possible to relate to some of the suffering the families had to endure. Others merely give a name and country and we are left to fill in the gaps with our imagination. 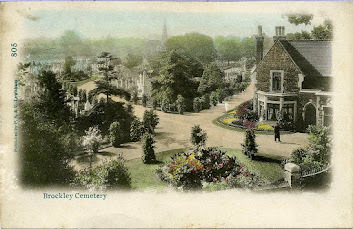 Henry and Elizabeth Ann Buddell lived at 52 Garthorne Road Forest Hill. According to the headstone they had three sons who served and died during or shortly after the Great War. Frank Buddell is recorded in the inscription as Company Quarter Master Serjeant of the 10th Royal West Kent Regiment (Serjeant is the old British Army spelling of Sergeant). The Company Quartermaster Serjeant (CQMS) in the British Army is the non-commissioned officer in a company who is in charge of supplies. The National Archive lists Frank as Colour Sergeant. Historically, Colour Sergeants of British line regiments were tasked with protecting Ensigns, the most junior officers who were responsible for carrying their battalions' Colours (flag or insignia) to rally troops in battles. For this reason the Colour Sergeant rank was considered a prestigious one given normally to courageous Sergeants who had attained accomplishments in battles. This tradition continues today as Colour Sergeants form part of a Colour Party in military parades. The 41st Division was withdrawn after the First Battle of Arras, 1918 (fourth phase of the First Battles of the Somme 1918), and sent north to Flanders where it held a sector near Ypres that was, for once, relatively quiet. Nonetheless, the average casualty rate for the British and Commonwealth forces during the Great War was around three hundred per day when not involved in a major offensive. Frank Buddell was killed in action 24th May 1918 aged 30. He is buried at Brandhoek, Belgium. William Henry Buddell was a Lieutenant in the 26th Battalion New Brunswick Regiment. Henry is listed on the Commonwealth War Graves database as Canadian, and this was a Canadian regiment. He was awarded the Distinguished Conduct Medal, or DCM which was instigated by the British Army as a means of recognising acts of gallantry performed by ther ranks' (i.e. non-commissioned officers) during the Crimean War in 1854; the Distinguished Conduct Medal was regarded as second only to the Victoria Cross in prestige. Acting upon the belief that during the Great War that the overwhelming demand for medals would devalue the prestige of those already available, the Military Medal was issued as an alternative to the Distinguished Conduct Medal from March 1916. Given that William is listed as a Lieutenant this implies that he joined as an enlisted man prior to 1916. The National Archive Medal Card lists him as a Serjeant Major, Canadian Infantry. He was appointed Battalion Adjutant on the 13th January 1919. The Battalion war diary shows that he was admitted to hospital on the 30th January 1919 with sickness. He died on the 2nd March. His funeral took place with full military honours at Tamines, Belgium, on the 4th February. It is likely that William died of Spanish Flu, a pandemic that lasted from March 1918 to June 1920; current estimates are that between 50 million to 100 million people worldwide died, possibly more than that taken by the Black Death. This extraordinary toll resulted from the extremely high infection rate of up to 50% and the severity of the symptoms. People without symptoms could be struck suddenly and within hours be too feeble to walk; many died the next day. Symptoms included a blue tint to the face and coughing up blood caused by severe obstruction of the lungs. In some cases, the virus caused an uncontrollable hemorrhaging that filled the lungs, and patients drowned in their body fluids. Albert Sidney Buddell was a member of the Royal Army Service Corps (RASC). This was responsible for land, coastal and lake transport; air despatch; supply of food, water, fuel, and general domestic stores such as clothing, furniture and stationery; administration of barracks; the Army Fire Service; and provision of staff clerks to headquarters units They were not responsible for ammunition and military and technical equipment, which were the responsibility of the Royal Army Ordnance Corps.. In 1918 the corps received the "Royal" prefix for its service in the Great War and became the Royal Army Service Corps. The British Empire mobilized 8,900,000 men during the Great War. There were 908,000 dead and 2,000,000 wounded. Albert died of his wounds over six years after the war ended in Europe. 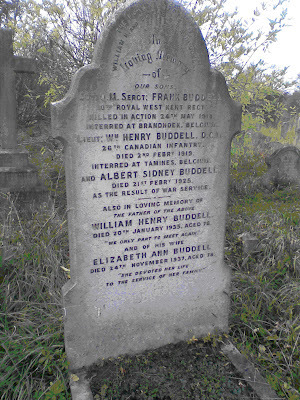 William Henry Buddell died in 1935 aged 76, his wife Elizabeth Ann Buddell two years later in 1937 aged 78 having seen three sons die as a result of the war.